I’ve been thinking a lot recently about fabrics stashes. Of all the beautiful and useful pieces of fabric that I, and probably every sewer everywhere, have stashed away somewhere not realising its potential whilst I (we) have been continuing to make trips to the fabric shop to harvest yet more. I like to think that, these days, I am able to avoid buying a lot of the unnecessary things that I know I was guilty of in the past. One of the ways I keep this consumption in check is by following the Wardrobe Refashion pledge to make and upcycle any new additions to my wardrobe, instead of buying cheap and badly made mass-manufactured items. However I fear I have merely transferred my shopping addiction from the purchase of cheap and virtually disposable clothes to the acquisition of a fabric mountain! I don’t want to be a hoarder and at this time cannot afford to be (both in terms of money and space), so I have set myself a challenge, complete with cute logo! The Stash Bustin’ challenge is to use only pieces from my fabric collection in forthcoming sewing projects as far as possible, only visiting the fabric store to pick up interfacings, linings and such that are needed to complete a project. However, I’m not going to be too hard on myself if I slip and buy a new piece of fabric before the entirety of my stash has been busted. If you yourself recognise a need to pare down your stash and are interested in joining me in the Stash Bustin’ crusade as some fantastic seamstresses already have, I’d love to hear from you and you are welcome to use the logo on your own blog, instructions for how to apply it can be found here. 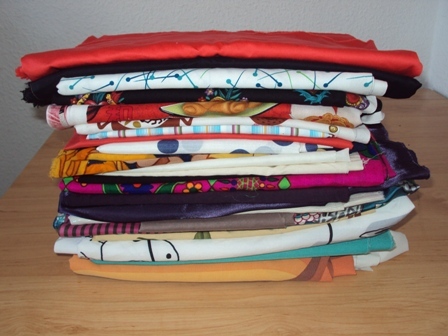 Some Stash Busters have decided to implement a ‘one in four rule’: purchasing one new piece of fabric for a project for every three projects completed with stash fabric. Others are implementing the Stash Bustin’ challenge as a positive part of a wider attempt to dramatically cut their expenditure for a given period. Whatever the motivation, there can be no denying the benefits of unearthing your (sometimes forgotten) fabric treasures and allowing inspiration to strike in regards to how they could be utilised. Maybe you might end up with a collated stash as beautiful and inspiration-filled as Amy Honey’s pictured at the top of this post, or maybe something a little less dazzling, but still very much full of potential, like the medium-light weight pile from my stash pictured above! So, dear sewers, are you in?! How I organize my fabric stash + free downloadable stash tags! I love this plan and it will make me do more patwork, too! I am so into this! I made a New Year’s resolution this year to not buy any new fabric, partly to bust my stash (although it is sadly not that big) and partly to force myself to focus on what I have and on the process of creating instead of acquiring. So far, so good. I’m happier, and more focused. Somehow the manic need to accomplish more is less and the enjoyment of doing what’s in front of me is more. I started trying to do this just after christmas. It was really temping to go out and buy new stuff during the sales but so far I’ve not given in. It’s been really interesting trying to be creative with what you have to make what you want. I am trying to go through my “stash”, but I’m also trying to find some really fine weave print cotton to use for summer skirts and dresses. Like the pinpoint cotton or kind they use for high end dresses. Where can I find and buy it?? Oh how I wish I had a stash to bust. Alas, I am poor, and my ‘stash’ is mere remnants! I kind of have a stash every so often when I find myself unexpectedly flush, but then I work my way through it in the leaner moments. and my husband would be soooooo pleased! Here’s a fun idea, why don’t we swap fabrics we do not want with each other? Yard by yard, put up pictures of fabric and we can swap for the print we want. New fabric for you, and a new friend. For various reasons I’m now trying to do this. In the fall I hosted a fiber buy/sell/trade (mostly yarn and fabric, there were some patterns in there too). It was fun. I agree with Erica and would LOVE to participate in an online one! My stash is out of control! I definitely need this. I am on board. What perfect timing! This will help keep my “stash goals” in check! Oh my, don’t get me started. My attic is stacked to the ceiling with box after box of sewing bits that I “might” use in the future. Old scraps are so hard to get rid of, each piece reminds me of what I made, who wore it, what the occasion was. My boxes of scraps hold as many memories as my boxes of photos! 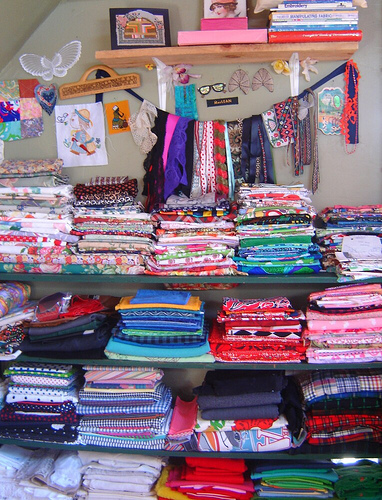 When my kids were small I struggled for space to stash my fabric hoard. I constantly looked for ways to keep it at a minimum. But now that the kids are grown and out of the house I have plenty of room. One of the few benefits of getting older, is having more space for yourself and your projects.